it's better to blame the jews than admit that global cooling is real? rules vary by state, but in VA former Democratic Virginia Gov. Terry McAuliffe restored the rights of felons in 2016 to vote and run for office. When she was called out for flying in a private plane when she was supposed to be traveling the state in an RV on a Vets tour, the Senator responded, "Paying on my own dime to visit more Missouri veterans is not something I'm going to apologize for"
Where is the threat? Hard to imagine a much worse day for the Trump family in court than yesterday. Short of any of them actually being on the stand. But all in due course. Nearly every Trump campaign associate indicted in Special Counsel Robert Mueller’s sprawling Russia probe has been charged with making false statements. But in a striking contrast, raising questions about a possible double standard, not a single person interviewed during the FBI’s Hillary Clinton email investigation was hit with false statement charges – even though investigators believed some witnesses were untruthful. The same laws are supposed to apply to everyone. Either you charge them all or you charge none. As long as there is consistency, I don't care which. On that note, (former FBI Director) Comey seems to have changed his story on (former National Security Advisor) General Flynn. 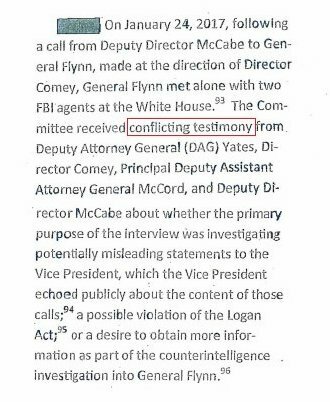 Having previously told Congress that Flynn didn't lie in the ambush FBI interview, Comey told Congress last week that Flynn did lie. One or other of Comey's statements has to be untrue, so no doubt we can look forward to Comey being charged with lying to Congress. I've said it before, what happened to a few of these guys is unpardonable. They were called in during the counter intelligence (Non-criminal) portion of the investigation, to be asked about non-criminal offenses. That was spun into felony charges. 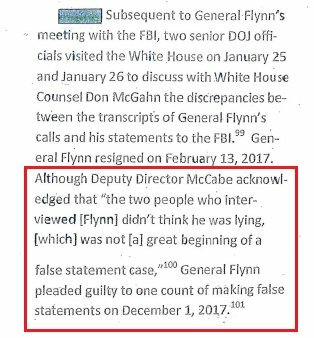 You can see Flynn assumed this was a standard debrief. Details of this interview were leaked HOURS after it was done (By Sztork) and then months later, despite it all being non-criminal, it was using to CREATE criminal charges. Congress asked them WHY they interviewed Flynn and they all gave different (conflicting) answers. That's called lying to Congress. And yet none of them has been charged with lying to Congress. The Flynn interview was a perjury trap. They weren't investigating a crime (there wasn't one), they were there to create a crime. A nice twitter thread indeed. Straight out of a Russian troll farm. lol, that's the best you can do? You are validating an anonymous Twitter feed by the fact that FoxNews is linking to it?!?!? Congress seems to have figured out what was going on and asked the usual suspects what the reason for the interview was. Flynn is so last year. Cohen and Tallywhacker are likely to be of much greater interest to that new congress.